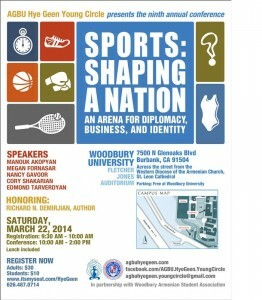 On March 22, I will have the honor of moderating and speaking at AGBU’s ninth-annual “Sports: Shaping a Nation” conference. Below is the press release. The news was also shared by such media outlets as the Masis Post and Pan Armenian. The AGBU Hye Geen has selected its speakers for their upcoming conference entitled Sports: Shaping a Nation. An Arena for Diplomacy, Business and Identity. This year’s conference continues to focus on the status of the Armenian Diaspora living in the U.S. Specifically, this year, the goal of the conference is to discuss how sports helps create a national identity, the role of sports in global diplomacy, how gender and youth are manifested in athletics and the value of sports for the individual, community and nation. The topic for the 9th annual conference explores the role of sports in a culture’s search for a place in the Diaspora while staying connected to the homeland. The goal of the conference is to educate the broader community, both students and non-students alike, on sports as a means of forging an individual and national identity. This year’s four speakers have extensive knowledge and experience in their respective fields. They have published books and papers regarding the various aspects of sports in the local and global framework. They bring their knowledge and expertise to help us understand the role of athletics within the greater context of what creates a national identity, both within Armenia and within the borders of the greater Diaspora. This year’s roster of speakers discusses these issues and perspectives in depth. The conference will be moderated by Manouk Akopyan, digital content producer for the National Football League. He is a journalist and writer whose in depth knowledge of sports gives him a unique perspective on its effects within an ethnic community. Nancy Gavoor, educator and athletics coach, talks about Sports Diplomacy, exploring how athletics are used to create bonds and dialogue among nations. Cory Shakarian, sports business executive, sales & marketing professional, will present on the Economics of Sports, exploring the importance of the financial aspect of sports on a nation and the individual. Why do countries vie to host the Olympics or the World Cup and U.S. cities compete to host the Super Bowl? How are the exorbitant salaries earned by athletes affecting the individual, team or its fans? Megan Fornasar is a graduate student of sociology at the University of California, Los Angeles. She will present How Fans Love Their Country. Her research into the use of sports in forging a national identity sheds light on the greater purpose of athletics; going beyond being a fan to instilling pride in one’s heritage. Edmond Tarvedyan, a trainer of world champions in MMA, boxing and Muay Thai, will speak on the importance of athletics for the youth in helping them forge their gender and personal identities. “Strong in body, strong in mind” is an example of how the importance of sports on the individual helps create a more confident, self-realized person. This year the conference will also honor Richard N. Demirjian, author of Armenian-American & Canadian Who’s Who of Outstanding Athletes, Coaches and Sport Personalities, a detailed anthology of every notable athlete from 1906 through 1989. This immense volume of 499 pages is a significant accomplishment that adds to the historical knowledge of the Diaspora showing the extensive contributions of Armenians in both college and professional arenas. Registration is at 9:30 A.M. The conference is from 10:00 A.M. to 2 P.M. Lunch will be provided during a 30 minute break. Woodbury University is located at 7500 Glenoaks Blvd., Burbank, California (Across the street from the Western Diocese of the Armenian Church, St. Leon Cathedral). Parking is free. “The AGBU Hye Geen emphasizes that the conference is open to both men and women since these topics are of interest to everyone in the community as a whole,” says Nellie Yacoubian, leader of the Young Circle. Continuing in its conviction of collaborating with other groups for the overall good of the community, the Young Circle is partnering with the Woodbury Armenian Student Association (ASA) for the production of the conference. AGBU Hye Geen is an organization that focuses on empowering Armenian women today as agents for change while preserving and honoring their achievements. The AGBU Hye Geen Young Circle helps the organization stay relevant by exploring different issues facing the current generation of Armenians now living in the United States. The AGBU Hye Geen organizes an annual conference to explore the potential of the Diaspora community in the various aspects of its development. Most recent topics have included “Cuisine: A Culture’s Ambassador” (2013), “Symbolism in Art, Architecture and Design” (2012), “Music as a Mirror” (2011), and “The Power of Broadcast Media on Ethnic Communities” (2010).